Most people surf Internet for looking articles on specific topic , the most reliable information are provided by the wikipedia , all the information that are available on wikipedia are free to access .I said all the information on wikipedia is almost reliable because there some standards should maintain to write the articles on wikipedia like providing citation and many other things.Wikipedia is access by almost every users in the world who use internet , some time there is need for user to print the articles of wikipedia or to create a EBOOK from wikipedia articles but people don’t know how to create PDF pages and create E-BOOKS from the wikipedia articles .There can be a two ways to doing it . One is the using a separate web page PDF file generator by using that you can create PDF or generate PDF files of any web pages including wikipedia articles another way is simplest way is to used the functionality provided by the wikipedia itself , yes wikipedia also provided you the free service to generate the PDF documents from the wikipedia articles as well as to generates the E-BOOKS from wikipedia articles.Let see how we can do these. 1.) First go to the any article of whom you want to generate PDF document , let say i am on Google Article on wikipedia . 2.) Now in the left column of wikipedia it provided you many free services like to change the language of articles , it also provide you service to generate articles in PDF format , we will first see on how to generate PDF documents . 3.) So click on the Download As PDF to generate PDF files , it will redirect you to a new page , where it start creating a PDF Document for you , for more information see below image. 4. )Once it done with generating your PDF files it will give you link to download it , as you can see in the below image .So after clicking the download link you PDF file will start downloading. That’s it your PDF file is ready to read , you can also create any PDF files using Microsoft Word in simple 3 steps. 1.) Lets say we are on any article page on wikipedia , now on left column we also seen a feature to create a book , see below image. 2.) 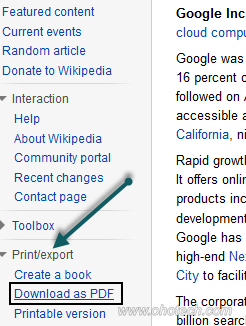 After clicking on Create a Book it will shown you a option near the heading of the page to add wikipedia articles to book .If you want to add current wikipedia article to the book then click on add this page to your book and the page will added to your book.See below image. 3. 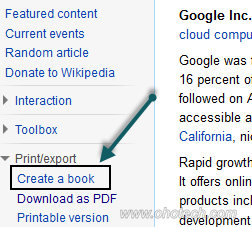 )Now you can search wikipedia article , and the article you want to include in your PDF files , just click again on add this page to your e-book .If you want to generate E-book or want to remove any article then click on Show Book ,see below image. 4.) In this manage page you can remove any article , which you don’t need and you can generate E-book by providing title and subtitle of the E-book and then finally click on download see below image. That’s it now it will start generating or creating your E-book Files as we have seen on 4rth point in creating PDF documents .Once it done with creating E-book , it will provide you a link to download it,click on the link to download your e-book.It will also provide you a feature to create word processor(open document) from the wikipedia articles.The Book generated is not secured but if any e-book is secured then how to copy text and images from it for that see. That all about it , i hope you like my this article if you have any query please leave comment and don’t forget to follow my blog .